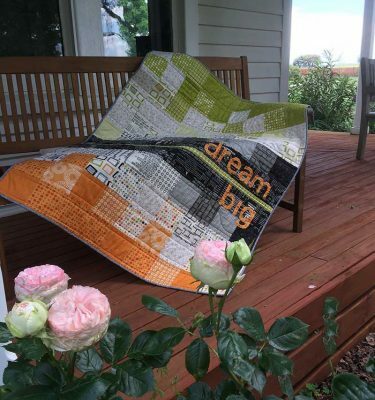 The Fat Quarter Shop have put out another quilt in their Shortcut Quilt Series – The Cobblestone Quilt – the shortcut quilt series has lots of great quilts that are quick and easy to sew together and get a fabulous finish with. The Cobblestone Quilt has large pieces in it, which means you can really showcase your beautiful prints! 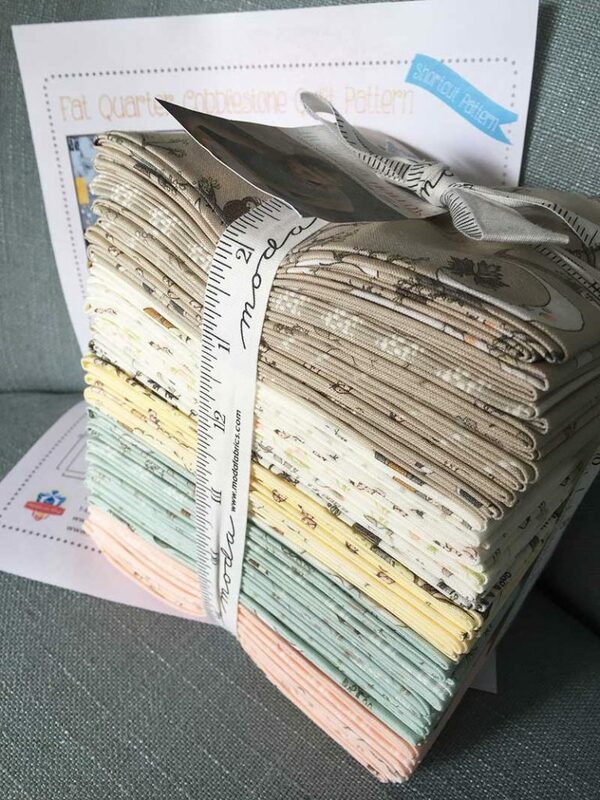 The pattern comes with different sizes, but for the same size I made (63” x 80”) you will need a fat quarter bundle with at least 25 fat quarters in it. I chose Hushabye Hollow by Lydia Nelson for Moda. It is gorgeous sweet fabric that is going to make a great baby quilt. 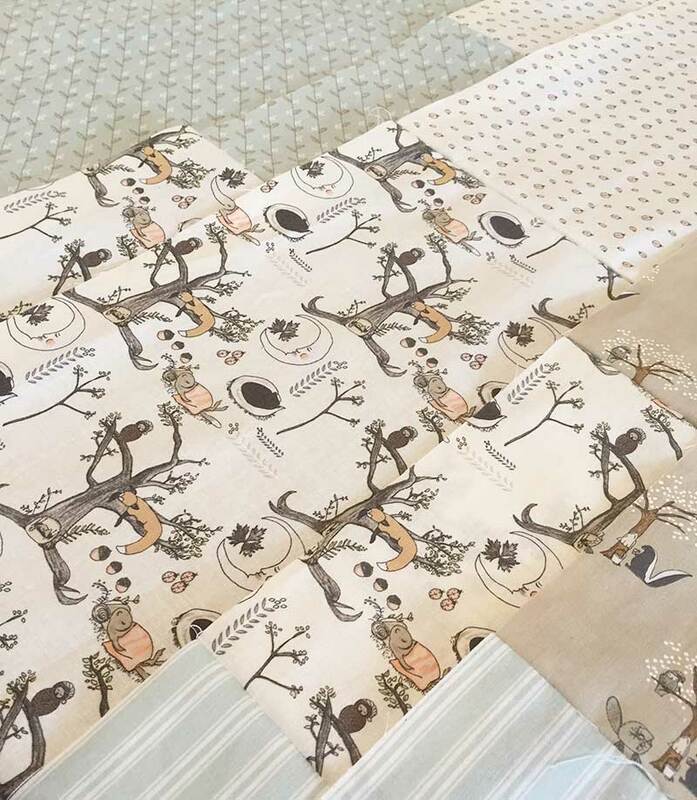 Hushabye Hollow is the next fabric line from Lydia to follow on from Darling Little Dickens, both lines have some super cute prints in them! I chose to leave out the pinky/coral prints as I wanted this to be a fairly gender neutral quilt. 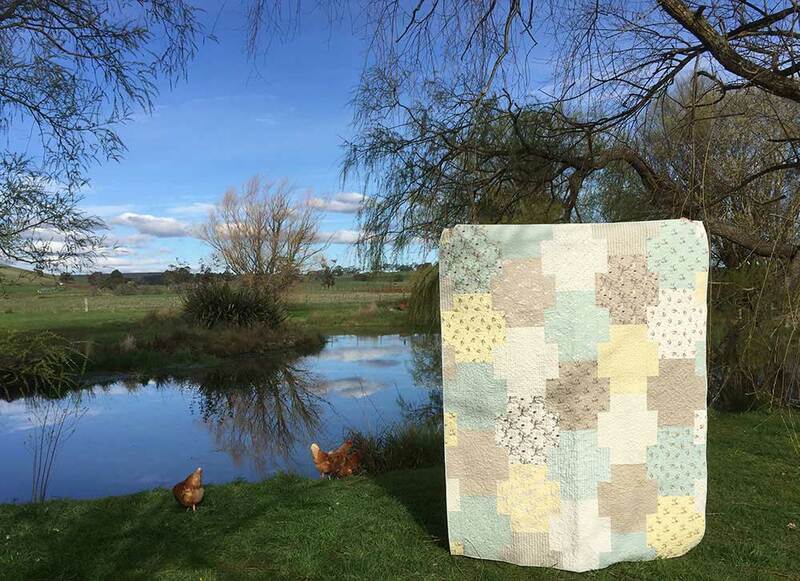 The pattern for the Cobblestone Quilt is available from The Fat Quarter Shop and there is a great video explaining how to make it up. This is one of those patterns that can look totally different depending on the fabric you choose. 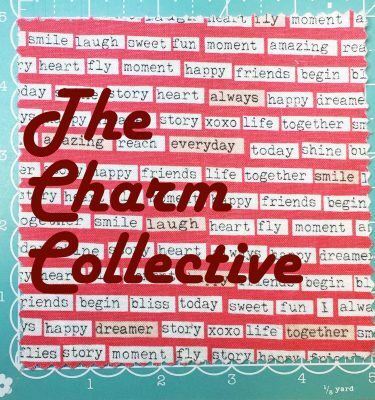 I love the FQS one using Fragile by Zen Chic! The Cobblestone Quilt makes up a pretty large quilt (63″ x 80″) and that is when I REALLY need a design wall… I have to make do with the design bed (the guest bedroom) but that is currently taken up with my Tula Pink Butterfly quilt I am doing as a sew along with @gnomeangel, the design floor (our lounge floor) but things can’t stay there very long or they get stepped on and mucked up, so my last resort for in progress quilts is draped over my cutting table. I took the leap and decided I was going to free motion quilt (FMQ) this quilt on my new Janome 9400. After quite a bit of swearing and thinking “oh what have I started?! 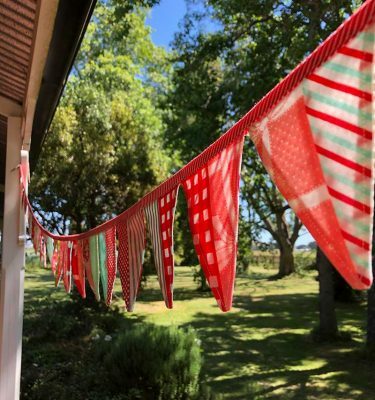 ?” I finally got into the flow with it and whilst on close inspection by other quilters it is not the best, from a distance it looks pretty good! I was very happy to have tried, and for the most part, succeeded with it! I like having a baby quilt (albeit a large one!) tucked away in the cupboard for that last minute gift. 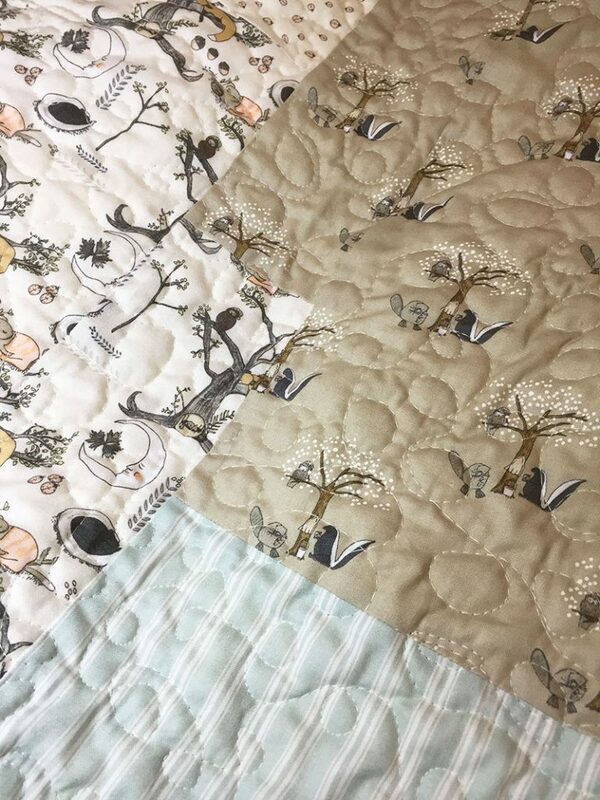 As the Cobblestone Quilt has different sizes in the full pattern I am very tempted to make another one in the crib size and then I am covered for all those baby announcements! 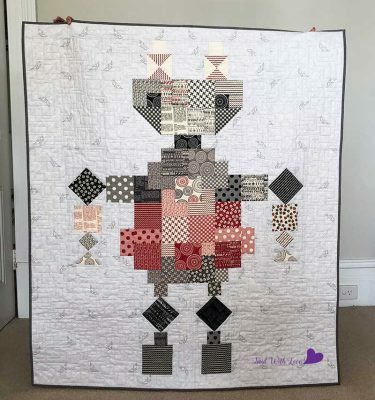 Check out the Fat Quarter Shop video and blog to see all the other quilts everyone else made to see how this quilt pattern can look fab in every style of fabric. Such a beautiful calm quilt, that’s going to be a lucky baby. Lovely to see your gorgeous home too, that water and sky is stunning. Thanks for dropping by my blog post Kendra ???? And you are welcome ANY time to come on up and enjoy the scenery, chickens, ducks, fabric filled craft room etc! It’s a lovely quilt! 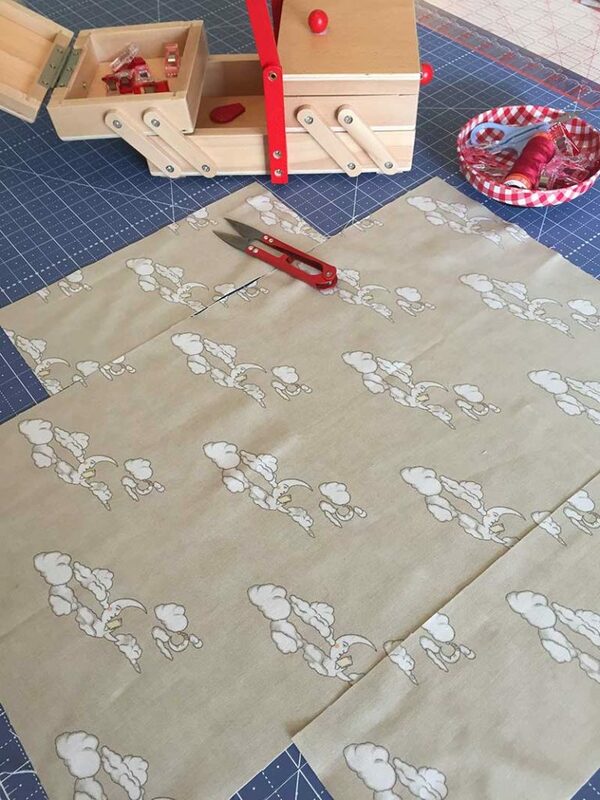 Having a pattern that is great for large scale prints is always good to file away and remember, and how wonderful to have a baby quilt on hand just in case. Yes I totally agree.. this pattern will get another outing for sure! Maybe a slightly smaller version though for a true baby quilt! 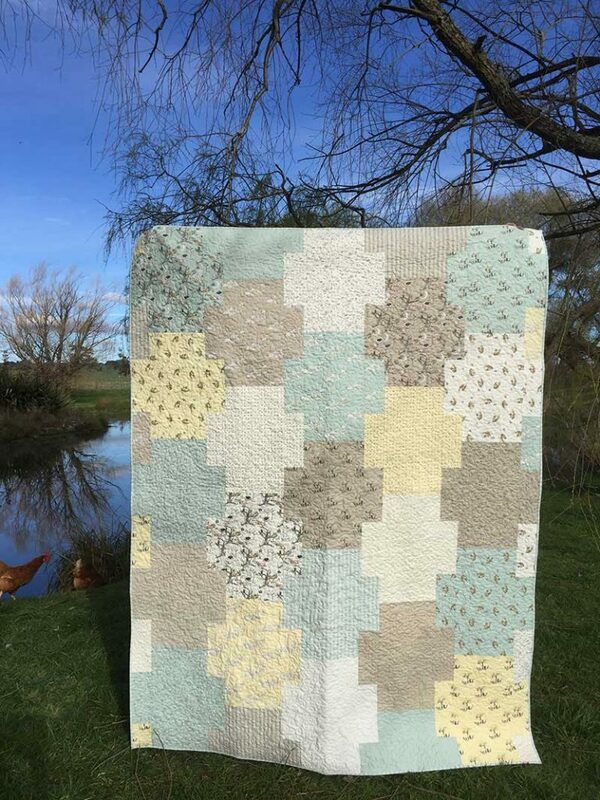 What a wonderful soft neutral colored quilt. I could rest quietly under this one. Thanks Mary – yes, it is a very calm quilt this one! Perfect for snuggling and reading a book I think ???? I was so excited to find this. I am new to quilting and the Hushabye Hollow is what I have chosen to do my three girls matching quilts in. However, I just wanted to SEE a blanket in these prints…I love it and am so excited to get started next month! Truly..how long did it take? I have my third girl coming in February and am hoping to have at least the two small ones done before I start on the twin size….do-able? Emily it is very do-able! It is a quick pattern, with large sections. 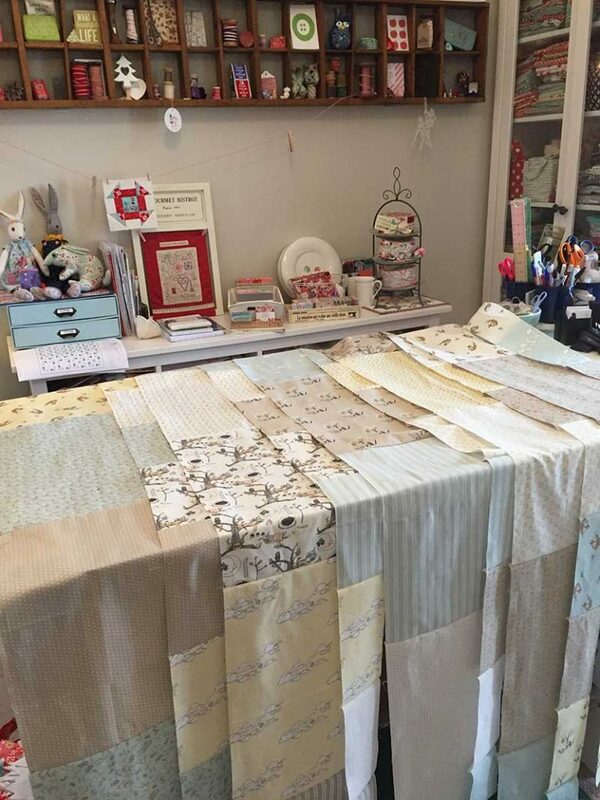 It is sewn up in columns rather than rows (ie downwards instead of the more usual across ways) so just lay it out on a floor or design wall to make sure you have your pieces in the correct order. I can’t remember how long it took me to cut and put it together…. We are talking over some days though, not weeks and weeks! I think if you sat down and did it all at once you could make a small quilt top in a day easily. 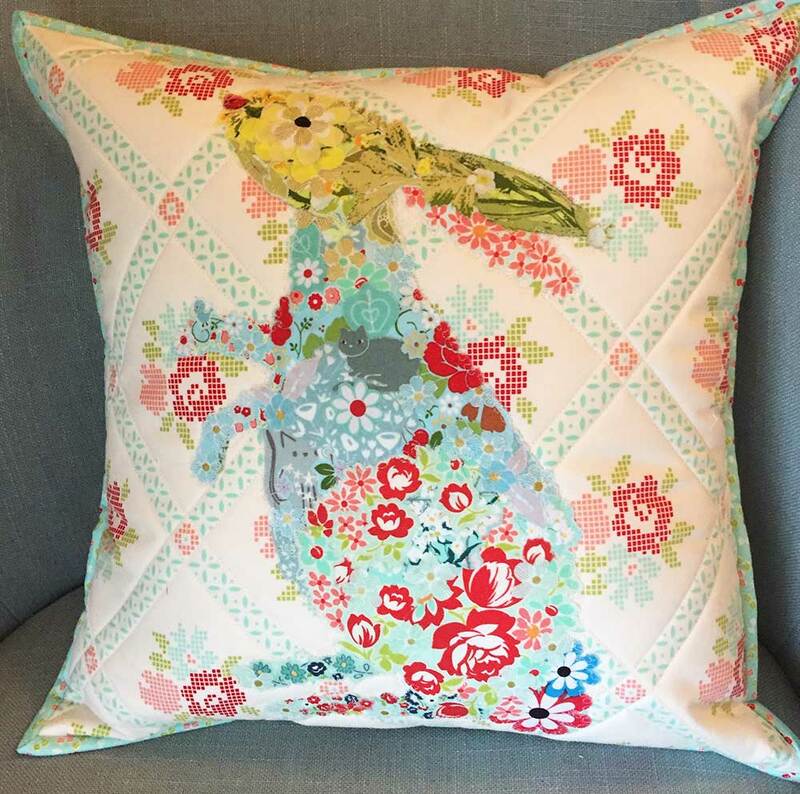 And Hushabye Hollow is just the sweetest fabric line – can’t wait to see yours! 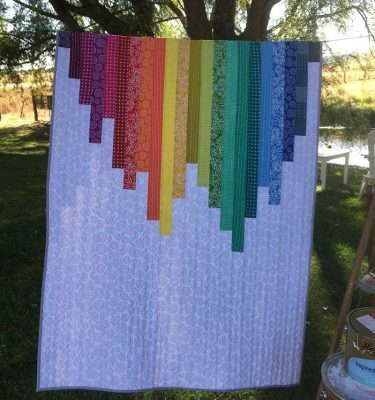 Such a gentle and pretty quilt! Thank you for participating in the FAL, on behalf of the 2017 global FAL hosts.